I had full intentions of writing several blog posts about the Biblical Fall Feasts, but God had other plans. Instead, I’ve been sick. Instead of big plans for these feast days, we are merely noting that they’re happening, quietly resting without any big dinners or hoopla. Being pregnant has certainly changed a lot of things around our house this year! Another author recently wrote about how the coming of the Lord is similar to having a baby. We know the baby is coming; we just don’t know “the day or the hour” (Matthew 24:36). However, I can certainly predict the season! For my baby, I know that it will be winter here in Minnesota and that I can prepare by having warm clothes ready. We know that the coming of Jesus will be “with the trumpet call of God” (1 Thessalonians 4:16). “Listen, I tell you a mystery: We will not all sleep, but we will all be changed— in a flash, in the twinkling of an eye, at the last trumpet. For the trumpet will sound, the dead will be raised imperishable, and we will be changed” (1 Corinthians 15:51-52). Just as Jesus was sacrificed as our Passover Lamb (Mark 15:25), was raised from the dead on the Feast of Firstfruits (1 Corinthians 15:20), and gave us His promised Holy Spirit at the Feast of Pentecost (Acts 2), many biblical scholars believe that “the last trumpet” will sound at the Feast of Trumpets in the fall. The unique thing about the Feast of Trumpets is that we really don’t know the day or the hour that it starts each year until it happens. 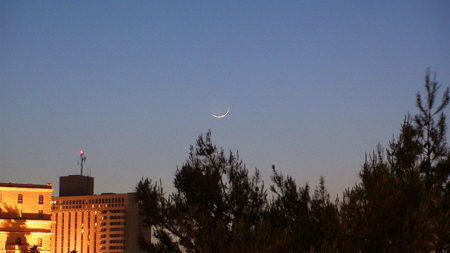 In Israel, a new month begins when the first sliver of a crescent moon (“the new moon”) appears in the western sky at sunset. As the time for the expected new moon comes, men in various parts of Israel watch the sky, looking for the signs of the new moon and the signal of a new month. When the new moon is sighted, they blow on a trumpet (a shofar) and announce it to everyone. This year, the men began looking for the new moon on Saturday evening, September 19. However, it was very cloudy in Jerusalem that night. Knowing that God controls even the clouds and the weather, it was pronounced that the new moon had not yet arrived. You can see why no one knows ahead of time exactly when the new moon will be sighted. Therefore, no one knows exactly when the new month will start, or when the seventh month in particular will start, or when the trumpets will sound. In the same way, we know that Jesus will return, but we don’t know exactly the moment of His return. Just as we prepare for the coming of a new baby, how can we prepare for Jesus’ return? “But you, brothers, are not in darkness so that this day should surprise you like a thief. You are all sons of the light and sons of the day. We do not belong to the night or to the darkness. So then, let us not be like others, who are asleep, but let us be alert and self-controlled. For those who sleep, sleep at night, and those who get drunk, get drunk at night. But since we belong to the day, let us be self-controlled, putting on faith and love as a breastplate, and the hope of salvation as a helmet. For God did not appoint us to suffer wrath but to receive salvation through our Lord Jesus Christ. He died for us so that, whether we are awake or asleep, we may live together with him. Therefore encourage one another and build each other up, just as in fact you are doing” (1 Thessalonians 5:4-11). There are many other wonderfully significant things about the Feast of Trumpets and the Day of Atonement (which will be September 30 this year and about which you can read in Leviticus 23:26-32). But this year, at our house, the celebrations will be quiet. I’d love to hear what you’re planning at your homes! P.S. Make a Rosh Hashanah or Yom Kippur interactive lapbook with your children! Thank you for this information Anne. I love seeing that Christ is our firstfruit, the fulfilling of the OT before shadow (tithe) of Christ to come. I feel that just as God was wroth with the priests in Malachai chapter 2 for withholding the ‘tithe’ from the widows, fatherless, etc Believer’s now need to not withhold Christ message from the lost. This year I ran out of time to do the table, especially since Yom Teruah was also on Shabbat. We had lamb, vegetables and honey baked apples. I also made us spiced pears with pomegranate and an apple-pomegranate crisp for the congregation. Yom Teruah has so many layers-the day He returns for us, the day He is crowned king, a day for lifting our voices and crying out to Him. In Israel, Yom Teruah was the day the new king would be coronated. We are also now in the days of Yom Noraim the- Days of Awe. These days are so we can truly look at ourselves and make teshuvah-literally “turn away from” our sin. Days of repentance so we can be cleansed on Yom Kippur-Day of atonement. 5 days after Kipppur, we enter into the “Season of our Joy” – Feast of Tabernacles/Booths/Sukkot. The first and eight days are no work days..the time in between you work but are still festive. Lots of special meals and I put out a tablecloth with autumn colors and we meet as a congregation on the first and eighth days. We build and decorate a congregational Sukkah, and have a meal and a small service. Beautifully written and I love all the extra info in the comments section!